Charles King Paris is proud to present his first luxury hand bag, the magnificent Clutch Bijou. Inspired by Glam Rock culture and enhanced with a touch of esoteric spirituality, the Clutch Bijou features exquisite master craftsmanship, fine attention to detail, premium materials, and authentic, limited edition, Swarowski embellishments. 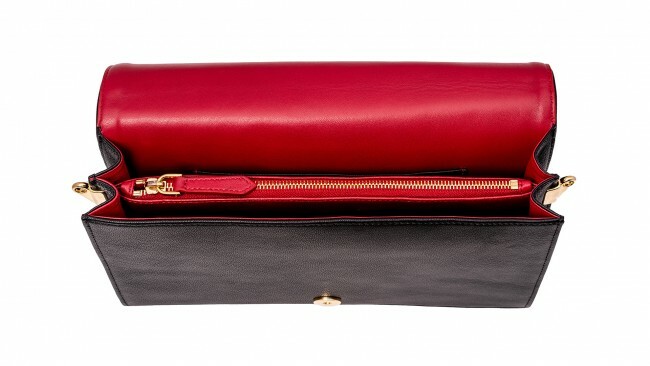 Our Clutch Bijou has been made in the pure tradition of the Haute Maroquinerie Française with every single detail meticulously crafted by top French Artisans. 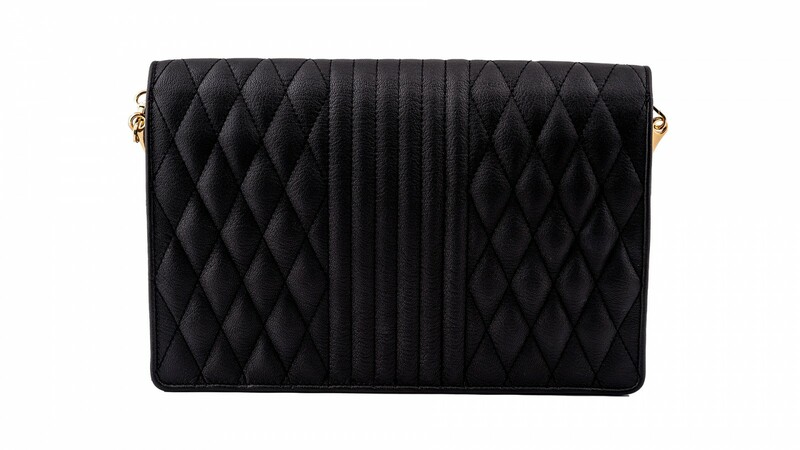 Because we’re convinced that details make perfection but perfection is never merely just a detail, we’ve selected only the finest materials to comprise our stunning clutch. 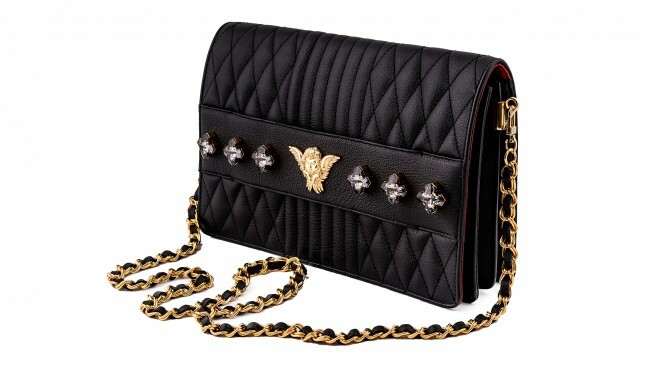 From the gleaming and finely wrought metal detailing, to the premium, top quality leathers, and the sparkling, Swarowski crystals that reflect the light - everything about this unique clutch communicates luxury and beauty. To encapsulate the Glam Rock spirit perfectly, for the exterior of the bag, we selected two chic matelassé patterns in premium Crispy Goat Leather. In the middle of the front flap sits a leather band, which plays two dual, and innovative purposes. Firstly, the leather band has been carefully positioned for comfort and ease of use, as a hand can be easily slipped through. Secondly, this positioning has also been chosen to impart a unique appearance, as when a hand is slipped inside the band, it gives the effect of a real jewellery bracelet, with a beautiful Angel detailing and 6 carefully crafted Greek Crosses complimenting it. The Greek Cross is a highly prized ancient holy symbol from the Medieval era, and has been painstakingly recreated for our Clutch Bijou with high-precision complex cutting. The Cross features a perfect symmetry of shape and beautifully rounded edges by Swarovski. The Angel sculpture, our brand emblem, was originally realized by the famous French Sculptor Xavier de Fraissinette, who spent more than one hundred hours perfecting it. In our Clutch, this breathtaking enblem is comprised of solid brass that has been expertly gilded with 24 Carat Fine Gold. Our Angel has been hand made using the pure tradition of Jewelry lost-wax casting, a precision technique that involves the pouring of liquid metal into a mold. The casting mold is created using a wax model that is melted away to leave a hollow chamber in the middle of the mold. This is the very same technique that’s been used for thousands of years by master craftsmen making precise reproductions of original Jewelry pieces. The inside of the bag has been lined in a beautiful, soft red lamb leather and features a selection of useful, differently sized pockets. Our two angels with trumpets logo has been gold printed onto the middle of the back of the inside flap, and under the inside pocket we’ve placed our distinctive CK logo. The gold chain has been custom made using an insert of crispy goat leather tressé which has been attached in a unique way that will allow clients to easily use the clutch with or without a chain. Inside the main zipped pocket sits a solid brass plate engraved with our Charles King Paris logo, the serial number, and the Made in France label. 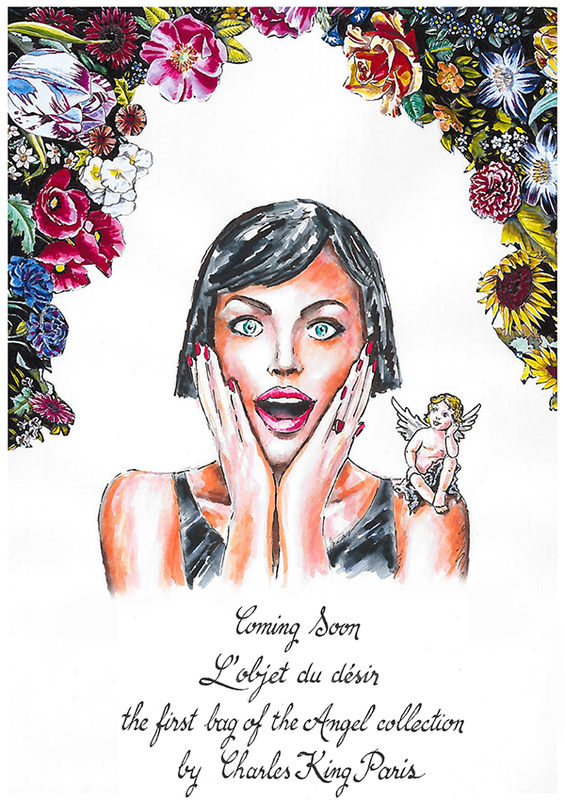 Even our packaging for our Clutch Bijou is totally unique, featuring a stunning collector flowers coffret, hand painted by the Artist Aldo Gigli, our Artistic Director. 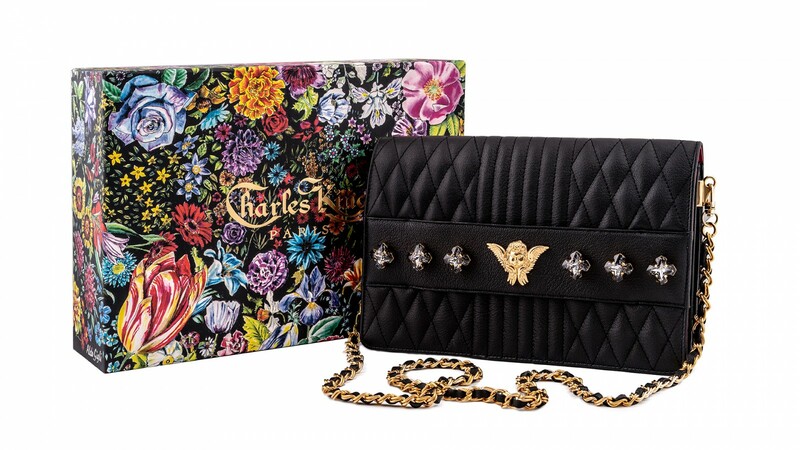 Charles King Paris is the new Luxury Brand for Exclusive Designer Hand Bags made in France in the pure tradition of the « Haute Maroquinerie Française » that has chosen to develop itself exclusively on internet. This innovative choice offers us the possibility to operate without any intermediate, and without any high premise rent. It allows us to concentrate all our efforts on the creation process, on the refinement in all the details and on the exceptional quality of manufacturing. Thanks to this direct access to our customers we are proud to be able to offer them exclusive bags at best prices.